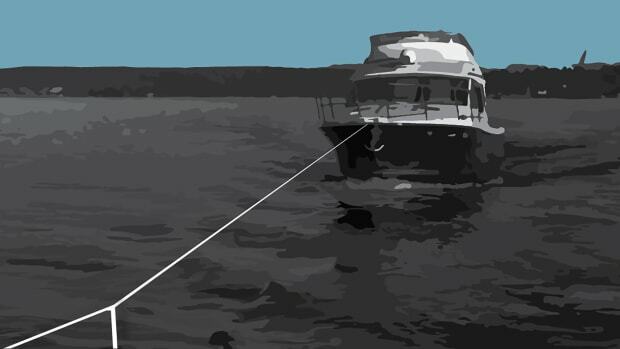 Some failures on cruising boats occur gradually, providing warning signs to those who pay attention. Gradually increasing vacuum pressure in the fuel filter warns of a developing fuel quality issue. 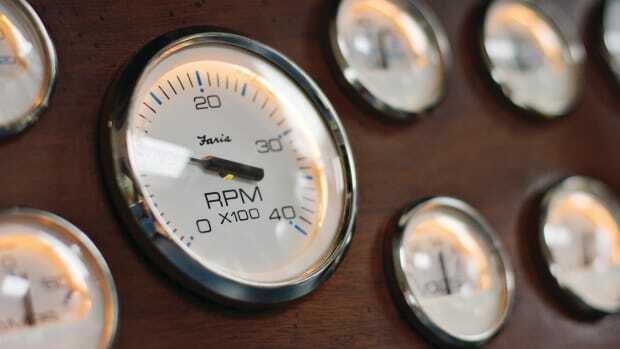 Climbing engine temperatures point to a brewing cooling system problem. Excessive heat on the alternator warns of an impending failure. Propeller shafts however, fail all at once, with no advance warning. Should this occur, a single-screw vessel will be left dead in the water and calling for a tow. 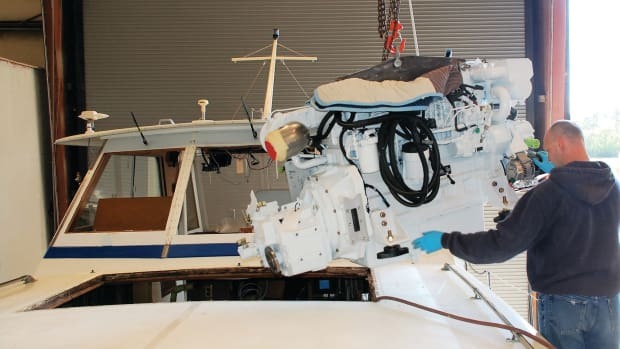 While most twin-screw boats can limp home, both will be facing a expensive repairs, including a haul-out, and a new shaft and prop. Given the risks and costs, it pays to understand why shafts fail and what steps you can take to reduce the likelihood. Wading into engineering literature about shaft failures on commercial ships and recreational boats leads you into a swamp of metallurgical discussions involving microfractographic evaluation, beach marks, oxides, ions, and much more. Shafts don’t just break—the process turns out to be quite complex. Fortunately, studies point to steps you can take to improve your chances. Let’s begin with a look at why shafts fail in the first place. At the risk of stating the obvious, shafts fail when the load exceeds the strength of the shaft material. Assuming that the shaft and prop have been properly engineered and safely handled for years of service without breaking, something must have changed: Either the shaft became weaker, the load became greater, or some combination of the two. Unless you recently made a substantial prop change (increased diameter, for example), load changes are unlikely to be the cause of failure because of the safety factor designed into the shaft specifications. With a weakened shaft, however, loads developed when running in rough seas, or when shifting aggressively while docking might be enough to break the shaft. For these reasons, we want to focus on preserving the strength of the shaft. Shafts lose strength due to metal fatigue, stress concentration, or corrosion. Fatigue occurs when we subject the metal to repeated cycles of loading and unloading. If you bend a paper clip enough times, it breaks easily. All propellers apply a rotational twist to the shaft, with the stress concentrated where the shaft enters the prop hub. Steeper shaft angles add another component: bending. The combination of rotational stress and bending leads to fatigue. What you can do: First, when changing props and increasing diameter, ask the prop shop or your yard to make sure the shaft’s size is adequate. Larger diameter propellers provide more torque and more potential for rotational fatigue. Whether you change props specs or not, the propeller must be properly and precisely installed onto the shaft. Failure to do so can lead to “prop rocking,” a slight cyclical movement of the propeller on the shaft. Assuming movement with each rotation, this might add up to half a million cycles in a day’s run. For an excellent outline of the proper procedure, visit: goo.gl/bj7Gf7. In addition, be certain that the space between the forward end of the propeller hub and the after end of the closest bearing does not exceed the shaft diameter. As this distance increases, the amount of movement within the shaft becomes greater, leading to metal fatigue. Finally, the clearance between the tips of the prop and the bottom of the boat should equal 15% of the prop’s diameter, at a minimum. Closer tolerances can lead to a variety of loading and vibration issues. The propeller transfers rotational and bending stresses onto the shaft, and this loading tends to be concentrated where the prop meets the shaft. Ideally those loads spread gradually onto the rest of the shaft. The greater the spread, the lower the likelihood of failure. Anything that concentrates the stress onto a small area must be avoided. Stress concentrations, sometimes called stress risers, put all metals at risk. On an aluminum sailboat mast, for example, all openings cut into the mast must have well rounded corners since leaving them square creates a stress concentration with the increased risk of a crack forming in the corner. In general, sharp edges create stress risers. As it happens, the area where the load transfers onto the shaft happens to have machining that can lead to stress concentrations. This is called the keyway. The keyway must be carefully machined, with corner radiuses and fillets. The forward end of the keyway should taper so that it ends gradually. “Spooning” the keyway end is the best practice: The keyway transitions into a smooth rounded area giving the appearance of the back of a spoon pressed into the shaft. ABS offers a specification for spooning and most USCG vessels require it. Eliminating these sharp edges and abrupt transitions will help spread the loads and reduce fatigue and micro-fracturing. What you can do: When replacing a shaft, insist that it be machined to ABYC standards. Check the keyway to make sure all machining utilizes radiuses and fillets with no sharp corners, and that the forward end of the keyway has been tapered to a gradual end. Stainless shafts suffer from three types of corrosion: pitting, crevice, and galvanic. Most stainless steel does not fare well underwater, and special alloys are required for this application. To protect itself from pests that would eat way at its trunk, a tree forms a skin we call bark. A healthy tree must regenerate any damaged bark or insects will attack the exposed area. A stainless steel shaft survives in much the same way—a thin film of oxygen forms at the surface, protecting the underlying metal from corrosion. Any breaks in this oxide layer will create an imbalance between protected and unprotected metal, starting a chemical reaction that leads to the development of pitting and crevice corrosion and consequently a weakening of the shaft. Not all stainless steel shaft alloys are the same and the differences matter. Low-grade alloy immersed in an oxygen-starved environment does not hold up well. 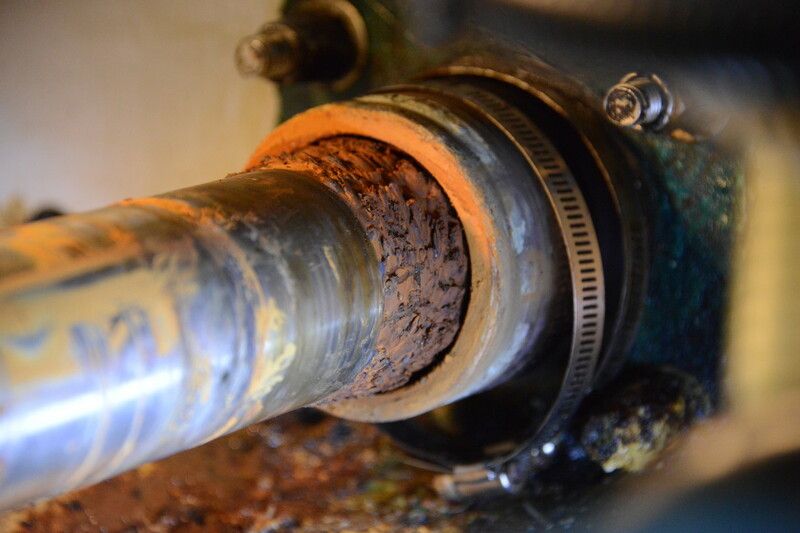 Severe scaling and corrosion have destroyed this shaft in the seal area. Ignoring the various trade names (Aquamet®, Aqualloy®, Nautalloy®), all use the same reference numbers, mostly 17, 19, and 22. The higher the number, the better the resistance to corrosion. 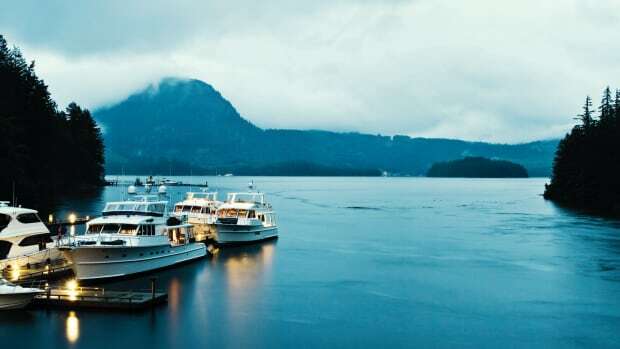 For recreational cruisers, the choice comes down to 19 or 22. Grade 17 should not be used. If you are not sure what you have, use a magnet. Only 17 will attract the magnet (some Chinese alloys of 19 or 22 will attract a magnet, and that should also be a red flag). If your shaft attracts a magnet, it would be prudent to pull it before any trip and inspect it for pitting or crevice corrosion. Numbers 19 and 22 have comparable strength (ductile and tensile), while 22 offers substantially better corrosion resistance. Unlike 19, grade 22 contains molybdenum—a crucial ingredient that fosters regeneration of the oxygen film when it is breached. That comes with a cost, which for a 2-inch diameter by 12-foot shaft, the cost difference amounts to a $700 increase for 22 grade. That’s money well spent, given the risks and the labor dollars spent on the replacement process. For a boat that stays on the move, you could make a case for saving money with grade 19. 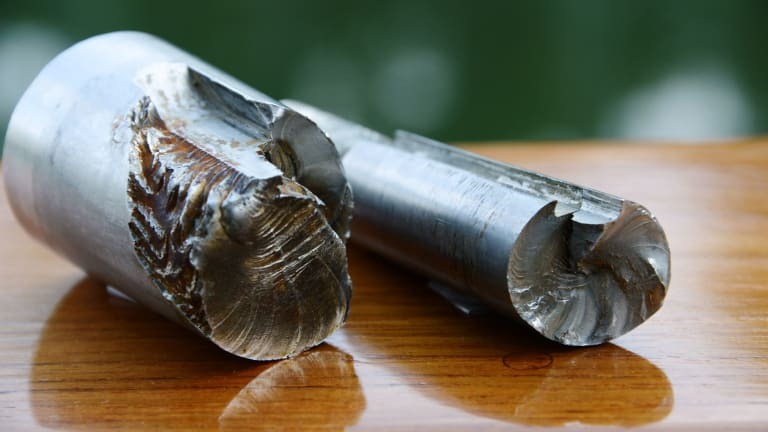 Boats that sit in the slip for extended periods have a greater risk of corrosion due to the lack of movement that would provide oxygen to starved areas (shaft seals, bearings, stern tubes). What you can do: Starting with the shaft material itself, it pays to go with the best. Regardless of the alloy, running the engine to turn over the water in the stern tube and briefly spinning the shafts to change the portion resting in the bearings and seals will help re-oxygenate the stainless. When the oxide surface film breaks down, the exposed metal loses its non-corrosive properties. The exposed metal will break down, forming a small hole or pit. This pitting tends to develop in areas where water flow is restricted, such as shaft seals and bearings. These happen to be areas hidden from view as well, keeping the pitting concealed until the shaft is pulled out. At what point does pitting threaten the integrity of the shaft? That question poses a difficult judgment call. How deep are the pits and how many? Will the boat be inland or offshore? What is the budget? Generally, pitting less than 1/8-inch deep can be tolerated, but that might be trumped by an excessive area of pitting. A process known as “cladding” can restore a pitted shaft. Cladding involves machining, welding, more machining, and straightening, and must be done by a highly trained machinist. Due to the expense of cladding, it usually is not cost-effective for shafts under 3 inches in diameter. In addition to strength concerns, pitting in the bearing area or the shaft seal can damage the bearing or seal. What can you do: When buying a new shaft, go with 22 grade if your budget allows. 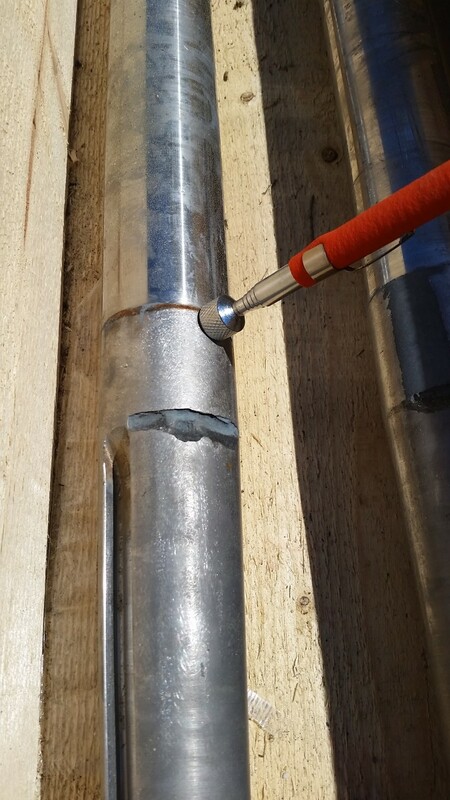 If your current shaft attracts a magnet, be on the lookout for pitting corrosion at your next haul-out. If preparing for a cruise, pull the shaft first and fully inspect. Although the chemical process for crevice corrosion does not differ from that of pitting corrosion, the causes vary. Crevice corrosion refers to a localized attack at the interface between two surfaces, or where a sharp edge occurs. This situation can occur, for example, where the forward end of the propeller hub meets the shaft. On lower-grade alloys this area will suffer from severe crevice corrosion (see below). On a microscopic scale, the same process takes place where small scars or nicks in the shaft surface develop. These small imperfections create flaws in that critical oxygen film, providing a foothold for crevice corrosion. One study published in the Journal of Failure Analysis and Prevention looked into the failure of a 2-inch diameter shaft that failed near the forward end of the taper. Relying on sophisticated testing techniques, they concluded that rotational fatigue began from the surface of the shaft near the keyway. They determined that the origin of the failure was “located on a surface flaw (recess or dent) of approximately 100 microns in depth.” That is merely one-tenth of a millimeter. While it might seem that a shaft fails all at once, in fact it is a process that begins long before the break. Microfractures form first, eventually leading to a small crack that grows until the shaft strength no longer exceeds the working loads. 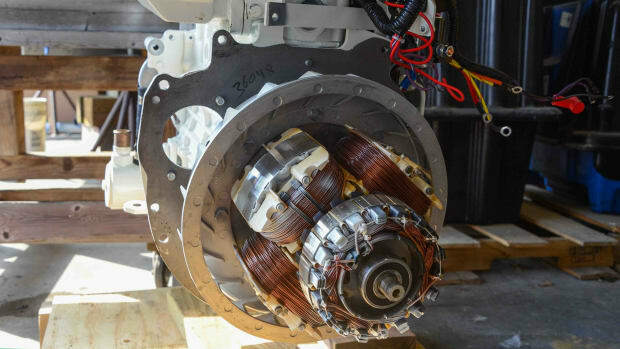 Only lower-grade alloys will attract a magnet. Severe crevice corrosion has developed at the forward end of the keyway area. What you can do: Never use a pipe wrench or pliers on your shaft. Avoid anything that would scar the metal. Barnacles can also provide starting places. Keep the running gear clean. 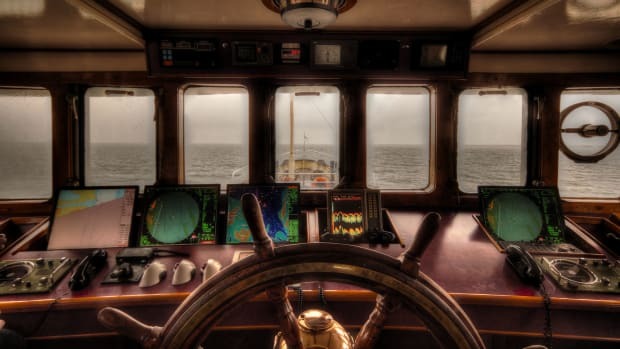 Consider using one of the products designed to prevent marine growth on metals. Cleaning a shaft with a steel brush can leave surface contamination that invites corrosion. Whenever you have your prop pulled, your shaft removed, or prior to any extended offshore voyaging, request a liquid penetrant test in the highest stress areas, around the keyway and just forward of the propeller hub. When cracks appear, the shaft should be replaced. Finally, we turn our attention to galvanic corrosion. Galvanic corrosion occurs when dissimilar metals are immersed in a conductive solution (seawater). Regardless of the alloy, your shaft needs a sacrificial anode. 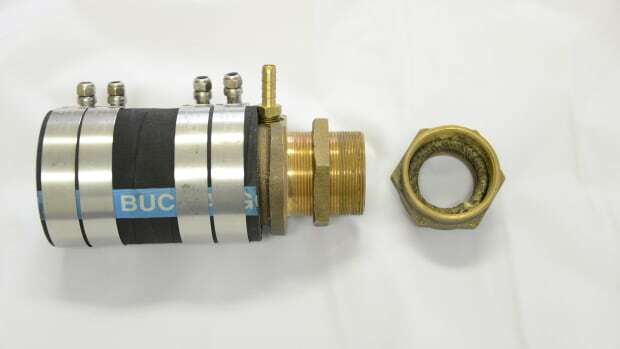 A collar anode attached directly to the shaft provides the answer. If your boat has a large anode on the transom connected to the bonding system, it will protect all bonded underwater metals. The shaft and propeller cannot be assumed to be bonded through the engine. 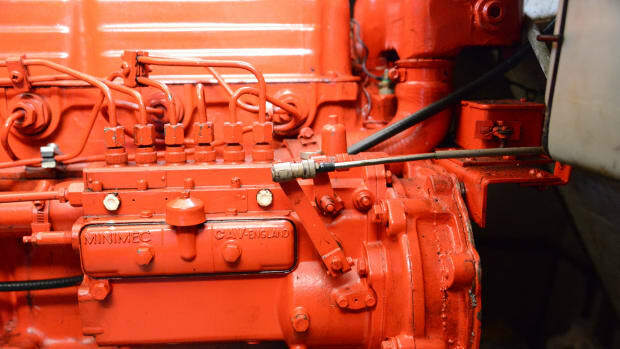 The shaft connects to the transmission, but the electrical continuity through the oil-bathed gears and bearings does not suffice. Bonding circuits must have less than 1 ohm of resistance. 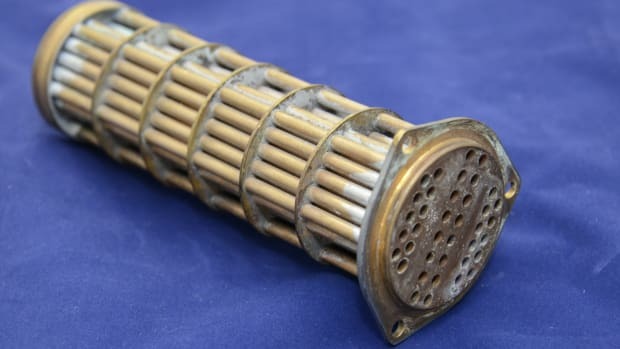 For this reason, a shaft brush is required to properly connect the shaft and prop to the common anode. Shaft failures in commercial shipping have prompted numerous studies and in-depth analyses. The forces and chemistry at work here reach an astounding level of complexity, with many interwoven processes. Instead of focusing on any one detail, a comprehensive approach provides the best results. Start with the proper shaft alloy, preferably 22 grade, make sure the propeller has been properly installed and meets the basic parameters described above, handle the shaft with care to keep it free of imperfections, and provide appropriate sacrificial anodes. Oh, and most important, keep a healthy flow of oxygen coming—that is, use your boat often.